Now knitting is harder. There is lots to think about. 1. How many projects do I need to take? 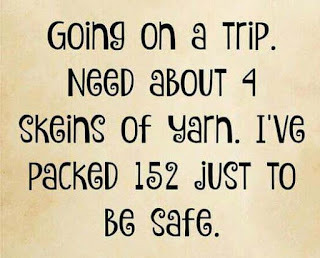 For me, I would gone for 16 days so I packed: yarn for at least 4 pairs of socks, two sweaters in progress, a cap that needed a tassel, yarn for swatching for a new sweater project and yarn for a class I was going to take. That seemed about right. 2. Patterns? Yes, for everything except the socks (will use my standard sock "recipe", which is memorized) and the cap that needed a tassel. Now, packing books can be heavy, especially since I wanted to save room for any souvenirs/new yarn that might beg to come home with me. So... time was needed to download patterns or make photocopies. Downloading can take a particularly long time, especially since I saved one of the patterns on Ravelry. One does not just pop into Ravelry for a minute. There are always new projects and patterns than must be looked at - and it would be rude not to see what your friends have been knitting. I wanted to leave a bit of time, too, to check out discussions on my favorite groups. Gathering patterns could easily take several hours, if not days. I also wanted to pack a pattern or two for something I might want to make in the future, just in case I saw the ideal yarn and had to have it. already housed in a cute little bag. I've tried that several times, but then, I need something from the bag and somehow it doesn't always make it's way back into the cute bag. It can take at least an hour to go over the gadgets in my mind. I had to "mind knit" the pattern - reading it over slowly and carefully and thinking what I might need to make the process easier. Do I need one stitch marker or several? Can they all be the same color or do I need some that are distinctive from the others? I'll need a tape measure - is it long enough, it is metric? I'd better pack a needle sizer, just in case. If I get far enough along on one of my projects I'll likely need a tapestry needle to weave in the ends or to work the Kitchener stitch. Should it be sharp or blunt? How big a needle will I need? Is one enough? 4. What needles should I bring? For my sock projects I was all set. I know that I'll need 4 US size 0/2.0 mm needles. But, what if I break one? Or get the urge to start another sock before the first one is finished. I'd better pack extras. My sweaters were in progress so they were already on the needles. I'd better check the pattern to see if the needle size changes somewhere. I was planning to swatch for a new project - more needles, but what sizes? I'd better pack extra sizes and lengths. Along with the needles, I had to make sure they are protected from bending or breaking. How to do that? I'd better pack needle protectors (so the stitches don't fall off the end) and a needle holder of some kind. Will I pack my needles in my checked bag or can I carry them onto the plane? Something to think about. As you can see, packing knitting is the hardest part of all. 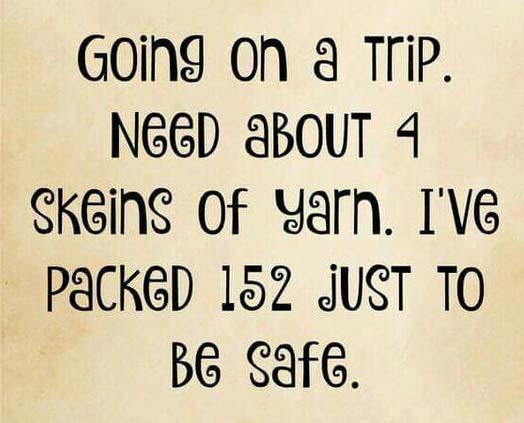 Forget the fact that there are more than 20 good yarn stores in the Denver area if I "needed" anything. There was also the fact that I was going to the Wool Festival in Estes Park with at least 50 vendors. How did I make out? 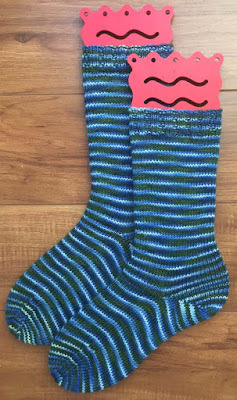 I finished 2-1/2 pairs of socks. Bought some yarn. Didn't work on the sweaters. Didn't swatch for another sweater. Didn't make a tassel. But I never ran out of anything, although I did shop - and I had a very good time. Each month The Loopy Ewe offers an exclusive colorway. This one is from June, 2016.